Grenada is the sort of small Caribbean island that defines the word exotic. Closer geographically to South America than the Windward islands to its north, Grenada measures just 133 square miles and is home to 110,000 residents who exist in an environment filled with profound natural beauty that's little altered by modern life. The nation’s three main islands are ringed by 45 white sand and nine black sand beaches while Grenada’s hilly inland is laced with waterfalls, hot springs, and tropical rainforests. Long popularized as the “Isle of Spice,” Grenada produces more nutmeg and cinnamon per square mile than any other nation, and its landscape, bereft of any structures taller than the church steeples in the capital of St. George’s, features acres of fruit and spice trees along with tropical flora and fauna. In fact, one-ninth of Grenada’s land mass is dedicated to national parks and wildlife sanctuaries. Highlights include Grand Etang Forest Reserve and Grand Etang Lake, a 30-acre lake formed from the crater of an extinct volcano. Leatherback turtles journey from as far as Ireland and West Africa between March and August to lay eggs on Levera Beach in the 450-acre Levera National Park. Grenada’s natural beauty belies a turbulent history of conflict and revolution that ranges from frequent 18th century colonial battles to the 1983 revolution and US invasion. Fort Frederick Fort George and Fort Matthew all offer panoramic views of the capital and mark scenes of skirmishes that once roiled across the territory. 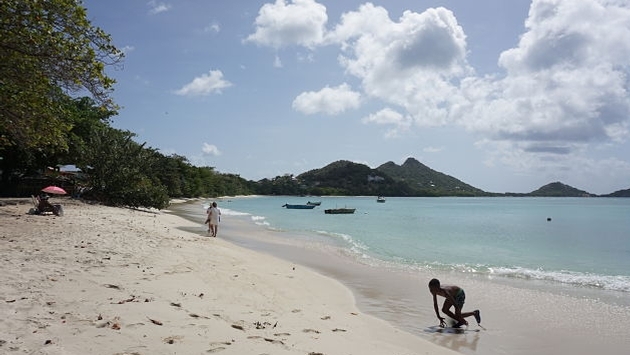 Grenada’s sister island of Carriacou (90 minutes away by ferry; 20 minutes by air) offers top-shelf diving and snorkeling with deserted, calm-water beaches and pristine coral reefs. Boat-building and fishing are traditions on 586-acre Petit Martinique, located off Carricou’s northern end. The three islands offer an array of diverse experiences within the tiny nation. US travelers can reach Grenada via flights aboard American Airlines, Delta Air Lines and JetBlue Airways. Service is also available from Canada aboard Air Canada Rouge while intra-Caribbean flights are available aboard Caribbean Airlines and LIAT. Accommodations include boutique luxury properties highlighted by the Spice Island Beach Resort, all-inclusive properties like Sandals La Source resort and family options including the Radisson Grenada Beach resort. There’s little not to love about Grenada, but here are five more reasons why the island should be on every Caribbean traveler’s must-visit list. READ MORE: Which Airline Loyalty Program is Best for Cheap Caribbean Flights? In addition to its lush natural beauty, visitors will find the brilliant red, green and yellow colors that adorn Grenada’s flag replicated almost everywhere—from boats in Carenage harbor to rum bars, street murals, retaining walls, fences and signposts across the island. A drive around the island reveals a panorama of pride that distinguishes Grenada from other Caribbean islands. Colorful is the only way to describe the roadside display at Charlie’s Bar, located just outside of the capital on a hillside road. The “Charlie” of Charlie’s Bar is proprietor Martin Oswell Nicholas, a former cruise-ship bartender and waiter who opened this local watering hole after returning to his home country following nearly a decade at sea. Charlie’s colorfully painted bar is nothing compared to the display on the hillside road outside, featuring all manner of displays, messages and ordinary objects transformed into a massive red, green and yellow art installation. Charlie’s specialty drink is “Lazarus,” one of a myriad of Caribbean aphrodisiacs/virility tonics made from all-natural ingredients. Charlie is extremely friendly and welcoming to visitors, who have made his bar a staple St. George’s visit. There are literally dozens of ways for visitors to experience Grenada’s natural beauty, from nature parks like the Grand Etang Forest Reserve—home to towering Mahogany and giant gommier trees, mona monkeys and the island’s staggering array of tropical birds—to the Underwater Sculpture Park in the Molinere Beausejour Marine Protected Area, which features more than 100 individual statues encapsulating Grenada’s history, culture and folklore. The Concord Waterfall, located just outside of St. George’s, is a picturesque spot for swimming and hiking. Entry to the waterfall takes visitors across privately owned lands. However, admission is only one US dollar, with a small gift shop and refreshment stand are located at the falls. Carriacou is the minuscule sister island of tiny Grenada, a 13-square mile haven of quiet white sand beaches, gentle hills and sweeping farmlands. Downtown Hillsborough, Carriacou’s main town, has six streets, two avenues, no stop lights and one gas station. There are four hotels on the island, along with several guest houses. Carricou’s dynamic culture lives in its inhabitants’ African and Scottish cultures, along with the rich boat-building tradition that exists to this day. Visitors can contemplate Carriacou history at the small but excellent Carriacou Museum in Hillsborough. The appropriately named Paradise Beach offers a secluded spot for swimming and relaxing, with a bear bar and a colorfully painted trailer housing products from Fidel Productions, a Cariacou-based maker of art, jewelry and clothing from local designers. The privately owned River Antoine Estate rum distillery is described as the oldest functioning water-propelled distillery in the western hemisphere, dating back to 1785. The huge wheel converts water rushing down from mountain streams to power and is used to pulverize sugar cane in the rum-making process’ initial step. The facility is one of the few left in the Caribbean (other examples exist in Haiti) that produces rum via the same procedures utilized 300 years ago. Visitors can witness the entire process up-close, then taste and purchase the rum, which is available only in Grenada.